Ye Mengyuan and Wang Linjia, the two 16-year-old Chinese school girls who died in the Asiana Airlines crash this weekend, aren’t around to experience the kind of knee-jerky modern racism toward Asians the tragedy inspired in both mainstream and social media. But 14-year-old Milena Clarke in Kentucky certainly has had an earful of the good old-fashioned kind face to face the last two years. Straight from the Paula Deen lexicon, those were just some of the point-blank epithets Milena says her own basketball teammates at Russell Middle School in Russell, Kentucky spewed at her incessantly since the 6th grade. The toxic mix of bullying and racism isn’t kid stuff. Milena, adopted as an infant from Kazakhstan, is nothing like the fictional Kazakh movie character, the jokey “Borat.” Milena’s features are more Asian, typical of the people from the country tucked between China and Russia in Central Asia. Indeed, Kazakhstan was the last of the Russian republics to declare independence in 1991. When Kentucky lawyer Terry Clarke and his family adopted Milena, he promised to help her never forget her ethnic roots. “I’d say to teammates why are you saying that, and they’d just laugh and start talking about me more, and I couldn’t do much about it,” Milena said. It’s a real example of racism that may seem out of place in a diverse world when Asian Americans are common in urban enclaves like San Francisco or New York City. But in Kentucky, Asians are just over one percent of the population of more than 4 million. As Asian Americans increasingly find themselves scattered throughout the U.S., they can often find themselves, like Milena, isolated and subjected to a fresh version of racism from a new generation. When I talked to Milena this weekend, she said after two years, the impact of the racist taunting began to affect how she felt about herself. What would be less likely, I asked? Milena said along with the verbal abuse came actual physical abuse. Teammates would shove, push, and trip her. And not like the Miami Heat did in Game 7 of the NBA finals. This wasn’t a game. It was an everyday occurrence. Wasn’t there ever a moment when there would be a time out? A break? “No, not really,” said Milena, who said she’d often pray that the taunting would stop. 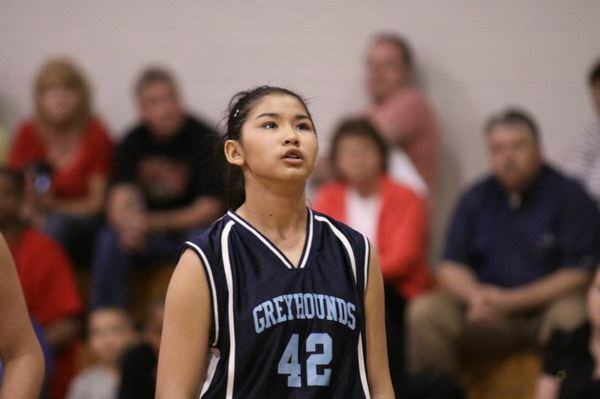 It got to a point in 7th grade where after a practice, Milena finally had to tell her father. “I went to the car and just broke down,” she said. Her father, an environmental lawyer, was angered. But first he reached out to the coach. And then to the school district. When nothing changed, he went to both the state and federal education departments. Finally, he sought legal help from AALDEF. AALDEF, which has had success fighting racial bullying at South Philadelphia High School, is taking on the case. It has filed official complaints with both the Justice Department and the Office of Civil Rights in the U.S. Department of Education. I put in a call to the Russell Independent School District, but Superintendent Sean Horne was unavailable for comment. What’s surprising to me is how long it took before Milena’s family decided it was time to fight back. Indeed, for a while, the Clarkes took solace by having Milena, who at 5′-8″ is a prized 8th grade center or power forward, play for one of the best travelling AAU teams in the area. That hurt Milena. But throughout it all, she said the most hurtful thing was when her school teammates went to the core of her being–her ethnic identity as a Central Asian from Russia. It hurts me as a parent to see someone like Milena go through this. It hurts even more to know that she’s such an innocent, she didn’t even know what the term “gook” meant. That is until she went on the internet and got her definition. This weekend she would have found much more. If you thought the internet was colorblind and free of racism (it’s all 1’s and 0’s, this digital world, right? ), all it took was an Asian airline crash to prove that it doesn’t take much to trigger a lot of suppressed racism. After the Asiana Airlines crash, I was astonished to see so many examples of anti-Asian racism in both mainstream and social media (primarily on Twitter). It remains one of the most underreported things about the crash of Asiana Flight 214. And what was truly astonishing was how it became suddenly debatable whether an Asian slur was a slur at all. Even amongst Asian Americans. Shouldn’t we know it when we see it, like Milena Clarke? Get it? Fright 214. Asians often confuse “L”s and “R”s. I first thought it was a hoax. Who would be this blatant? Or maybe someone was playing around on the internet. Didn’t matter really, it was still a racist thought. Then Monday morning, Jim Kirk, the publisher and editor-in-chief of the Chicago Sun-Times, apologized. Thanks for the cop-out apology…”if anybody was offended”? And if you weren’t, party on? The Flight/Fright pun is no different from the “chink in the armor” racist double entendre we saw during the media’s Linsanity frenzy last year. One can plead innocence, as a pun does let you have it both ways, but there’s no doubt that racism is present. The bigger question: where’s the sensitivity to diversity? To Asian Americans? A diverse staff of editors would have known better. A staff sensitive to Asians and Asian Americans would have caught that. That’s the digital mainstream. Chicago Sun-Times.com. The Twitterverse is like the Wild West. But I still didn’t expect to see the flat-out racist tweets on the same day as the crash. Dismiss the communications on Twitter at your own peril. It’s a real reflection of the way racism exists today. In fact, the digital world can at times provide just enough anonymity to embolden racists who would otherwise suppress their racism and keep it to themselves. As I said, I find it equally disturbing that some Asian Americans are debating whether these slights–by the Sun-Times or on Twitter–are a big deal at all. Considering that most Twitter users are between the ages of 18-29, they may not be aware of how this all fits into the history of racism toward Asians and Asian Americans. In that sense, a pun created by using an “L” over an “R” vs. a racist tweet may seem like nothing, especially in a world where nothing lasts and everyone’s on to the next thing. But it does all add up. I noticed people on Twitter who were sensitive to what was happening were mostly not Asian Americans; they were African Americans like “This Week in Blackness” host Elon James White (@elonjames), who called out the racist tweeters and their lame Asian driver jokes. That made it important for non-Asian Americans to be “first responders.” And when the two deaths of the Chinese school girls became known, the jokey racism they alerted us to was exposed for what it was–obscene. At that point, there should be no debate. You take a stand. You speak up. Or as b-baller Milena Clarke might say, you post-up and go for it.